Obama came here recently and it sparked my interested to write a review. I’ve been going to Hawaii every year and have been dying to try this place. That’s why I was super excited when K took me here on my birthday a couple months back. Seated in the boonies of Honolulu on top of an office building without an ocean view, the restaurant makes up for it’s poor location with superior service and tasty food made from local Hawaiian ingredients. Upon making reservations, K notified the restaurant that we would be celebrating my birthday. With that, I had been greeted 3 separate times with a “happy birthday” from 2 hostesses and a waiter before sitting at our table by the window. I was even presented with a personalized menu with a birthday message signed by all employees working the restaurant that night! Being a 5 star restaurant serving $40 dishes, Alan Wong’s sets the pretentiousness aside and treats its guests like family. When on vacation in Hawaii, it was only right that we started the meal off with a passion fruit mojito and a piña colada. 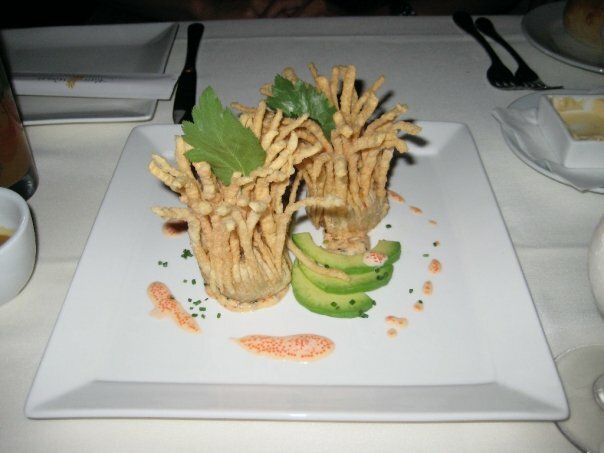 We ordered the Tuna Tartar and Avocado Tower for an appetizer. It was fried just perfectly so the tuna was still raw. The only thing about this dish was that it was difficult to eat elegantly. I had to sneak in bitefulls using my hands when no one was looking. 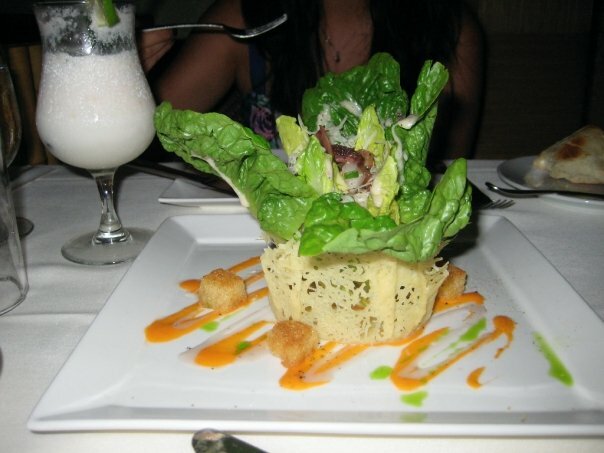 Next on our appetizer list was the caesar salad. I had been eating so unhealthy during my trip to Hawaii, I felt like I needed to order some greens to balance it out. There was nothing too special about the salad other than the parmesean bowl it was served in. If you know me, you know I love cheese. Now onto the entrées. 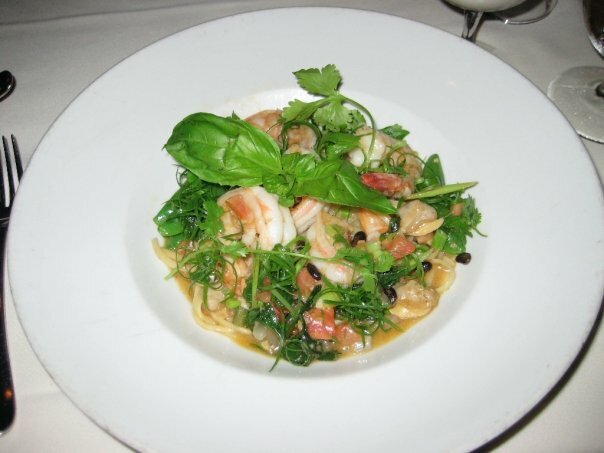 I had the Sautéed Shrimp and Clams Linguine pasta with a chili garlic lemongrass black bean sauce. I initially wanted to order the butterfish, but someone snatched the last one before I could place my order. So since I had my heart set on that butterfish, I wasn’t able to properly enjoy my meal. It was good, but not the best thing I’ve ever tasted. On the other hand, I am notorious for loving what other people order over my own dish. “Grass is always greener…” right? So to live up to my name, I thought my boyfriends dish was amazing! 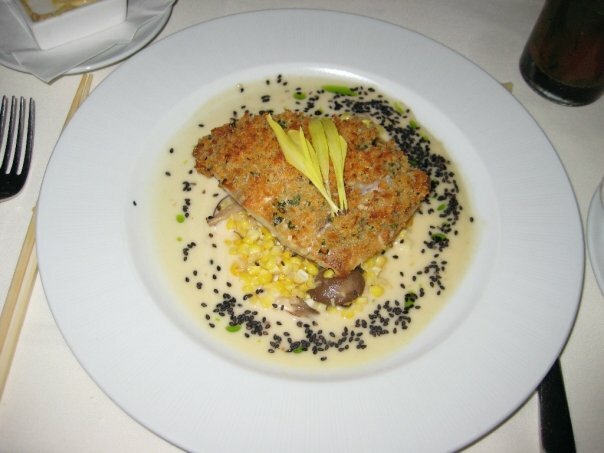 He ordered the Ginger Crusted Kona Kampachi with miso sesame vinaigrette, organic Hamakua mushrooms and corn. I liked his so much, I almost asked to trade. The miso vinagrette was sweet and creamy – not too salty which can often be the case with miso sauces. The fish melted in my mouth and you could barely taste the ginger, which was a good thing since I’m not a fan of ginger. 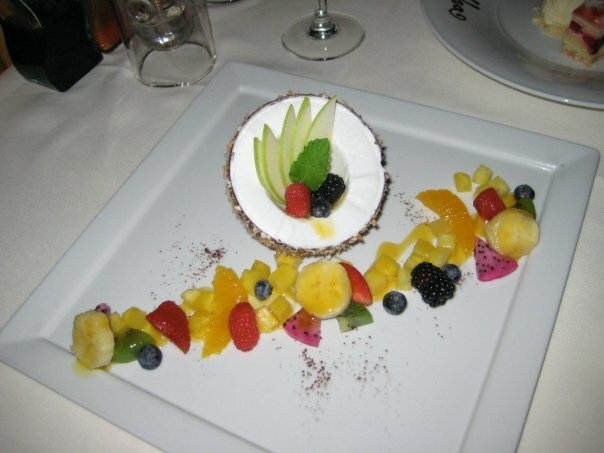 For dessert, we ordered the Coconut haupia sorbet served in a chocolate shell with an assortment of local exotic fresh fruit. This made my night. It had to be the best dessert I’ve ever had at a restaurant. The sorbet was rich – almost like ice cream – and the chocolate shell was thin enough for it to melt at first touch when it met my tongue. If you come to Alan Wong’s, this dish is a must. 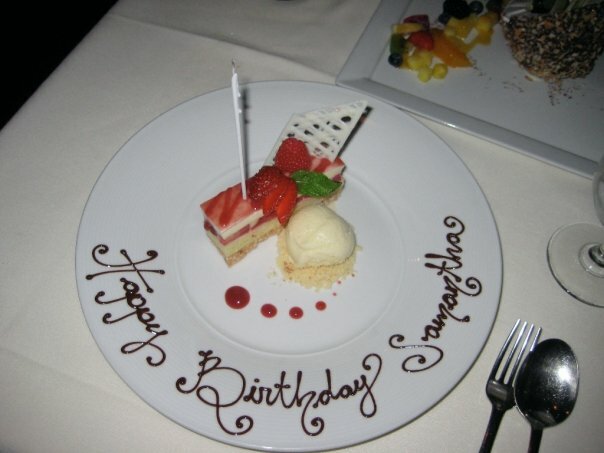 Last but not least, the restaurant presented me with a strawberry shortcake on the house for my birthday. It was made with a spongecake, making the dessert light and airy. We were so stuffed at the end of the meal, we had to leave this one half eaten. Et all, Alan Wong’s is an experience. With a full stomach and an empty wallet, we left Alan Wong’s pleased. I probably won’t go back since it was so pricey, but I’m glad to say I’ve eaten at the same restaurant as Obama!